An in-depth analysis of the “historical evidence” underlying China’s claims shows that history is, in fact, not on China’s side. If anything, Beijing’s claim to the Spratlys on the basis of history runs aground on the fact that the region’s past empires did not exercise sovereignty. In pre-modern Asia, empires were characterized by undefined, unprotected, and often changing frontiers. The notion of suzerainty prevailed. Unlike a nation-state, the frontiers of Chinese empires were neither carefully drawn nor policed but were more like circles or zones, tapering off from the center of civilization to the undefined periphery of alien barbarians. More importantly, in its territorial disputes with neighboring India, Burma, and Vietnam, Beijing always took the position that its land boundaries were never defined, demarcated, and delimited. 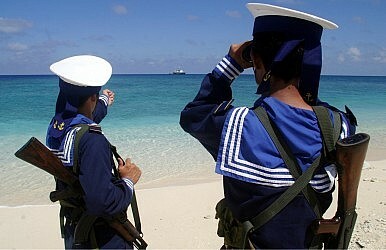 But now, when it comes to islands, shoals, and reefs in the South China Sea, Beijing claims otherwise. In other words, China’s claim that its land boundaries were historically never defined and delimited stands in sharp contrast with the stance that China’s maritime boundaries were always clearly defined and delimited. Herein lies a basic contradiction (ji ben mao dun) in the Chinese stand on land and maritime boundaries which is untenable. Actually, it is the mid-twentieth-century attempts to convert the undefined frontiers of ancient civilizations and kingdoms enjoying suzerainty into clearly defined, delimited, and demarcated boundaries of modern nation-states exercising sovereignty that lie at the center of China’s territorial and maritime disputes with neighboring countries. Put simply, sovereignty is a post-imperial notion ascribed to nation-states, not ancient empires. The notion of sovereignty is not a Chinese or Asian notion but a European one that originated with the signing of the Treaty of Westphalia in 1648. It was primarily a land-based concept and did not apply to nation-states in Asia and Africa until the mid-twentieth century. The Westphalian state system based on the concept of legal equality or state sovereignty over clearly defined external boundaries distinguished itself not only from the old feudal system in Europe, but also from other forms of hegemony and suzerainty that existed at that time in Asia—in Persia, China and India. Before the Treaty of Westphalia, kingdoms and empires in Europe and elsewhere could not claim or exercise sovereignty. The Crucial South China Sea Ruling No One Is Talking AboutBeijing’s Formidable Strategy in the South China SeaLearning From the Battle of the Spratly IslandsChina's Most Important South China Sea Military BaseCould Trump Actually Start a Nuclear War?